We all know that first impressions are the ones that last the longest. In today's competitive world, a bad first impression can be the difference between success and failure. When it comes to first impressions, how does your company measure up? ACF provides graphic design in Tampa that will make sure your first impression is a good one! Whether you need folders, websites, business cards, or an entire new identity, ACF, a company specializing in graphic design in Tampa, will help you get a professional look for your company. We specialize in taking your concepts and delivering you a final product that you can be proud of. We'll work with you to learn more about your company to make sure that we deliver the message you want your target market here. Let us help your company get noticed! Print advertising is a great way for a company to get noticed. Our Tampa graphic design firm can work with you to determine the best way to communicate your message to your target market. We specialize in a wide variety of print advertising techniques, so no matter how you want your message conveyed, we can find a way to make it work! We'll take your idea and go from concept to completion. Is your company in need of a website design? Our graphic design team in Tampa also specializes in custom website design! We can help make you a website that can be used as an effective marketing tool. We use state-of-the-art development and management tools that allow for updates and changes to be made easily. Our programming model allows for every page to be optimized for search engines, so people can find your company online and start using your services. 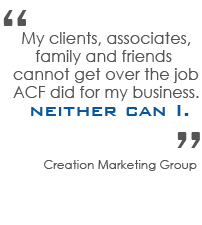 Whether you need printed materials or a custom website, ACF can provide you with experienced graphic design in Tampa. To view samples of our work, click here. Are you looking for printing? We do that too! ACF's Tampa graphic design firm team works closely with several printing companies, making us a true one stop shop for all your graphic design and marketing needs. From business cards to billboards, we have your printing covered. Our printers use a variety of printing methods, inks, paper types and substrates, so you'll be sure to get exactly what you're looking for.